Scientists Jonathan Berger from UC Santa barbara, Robert McMeeking and materials scientist Haydn N. G. Wadley from the University of Virginia has developed metamaterial that is the world's first to achieve the theoretical limits of stiffness. 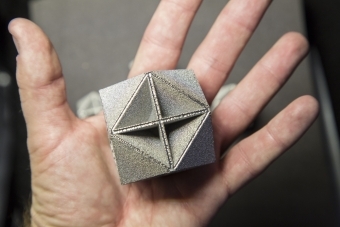 The metamaterial called the Isomax is a hard foam based on repeated formation of geometrically shaped cells. Isomax is lightweight and contains mostly air but it is the toughest material ever designed. Berger got the idea of the design when he was searching for material with the lesser density in terms of overall mass, but will offer maximum stiffness and crush resistance. If you look at the arrangement of metamaterial, it consists of ordered cells separated by walls that form the shape of pyramids and reinforced inside with intersecting diagonal walls. According to researchers, diagonal walls resist perpendicular crushing forces and the pyramidal shape gives stability and resist shearing forces from opposite directions. So this geometry facilitates Isomax to be stiff in all directions. Also, the cell structure enables Isomax to resist crushing and shearing forces without making it denser. So the next step would be to investigate the stiffness of metamaterial in the lab. This will be followed by the manufacturing process that would enable the material to be fabricated efficiently. -After successful manufacturing metamaterials find a wide range of applications spanning from packaging materials to prosthetic devices. -The material also can be used in aerospace structures, for lightweight automobiles, and in many robotic machines.